Oh, poor maligned Mr. Brussels Sprout. Seems like he gets pulled out every year as a Thanksgiving side and then is forgotten the rest of the year. Can’t you just imagine him in a group therapy session for one-day-only vegetables? One of my Thanksgiving tasks as a kid was to cut little X’s in the bottom of each sprout. I remember my mom explaining to me that the core was more dense than the leaves so the X in the bottom helped it cook through more evenly. The sprouts were steamed in the microwave until they resembled very small, necrotic brains. (Sorry, mom.) That was our annual dose of Brussels sprouts: soggy, yellow-green balls alongside the temptations of sausage dressing and mashed potatoes and cranberry jello salad and sweet potatoes topped with mini marshmallows or – once we became sophisticated eaters – brown sugar and pecans. Guess which side-dish wasn’t so popular? I love Brussels sprouts these days, and this simple skillet preparation is a standard at our house throughout Fall and Winter. The trick is to not skimp on the olive oil or the salt. These should have that potato-chip-snack-able quality to them. The cumin adds a touch of warmth that I really like. These don’t take up any room in the oven, so they are excellent for Thanksgiving, but please don’t relegate Mr. Sprout to just that one day. Show him some season-wide love. The poor guy needs it. A hot cast iron skillet, a little cumin and lots of salt and olive oil turns Brussels sprouts into something deliciously snack-worthy. 1/2 teaspoon freshly ground black pepper, or to taste. Rinse and trim Brussels sprouts. Cut off the bottom end and halve sprouts. Toss Brussels sprouts in a bowl with half (2 tablespoons) of the olive oil, salt, cumin and pepper. Heat a large cast iron skillet or pan over medium heat. Add the remaining 2 tablespoons olive oil to the pan. 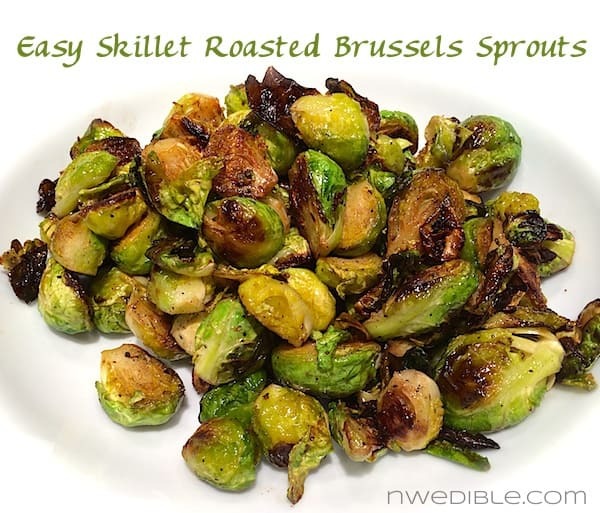 When it shimmers, add Brussels sprouts to skillet and spread sprouts out in a single layer. Allow sprouts to cook without stirring or shaking the pan for 3 to 5 minutes, until a nice caramelized sear has developed on the sprouts. Toss the sprouts, trying to turn most of them brown-side up in the pan, and finish cooking on the other side, about another 8 to 10 minutes. Adjust heat as necessary and stir occasionally so sprouts cook without burning. When done, the sprouts should be tender all the way through but not mushy, and richly brown in places. Add additional salt as desired and serve right away. Cut the sprouts into bite-size, uniform pieces. The littlest sprouts can stay whole, but halve most of them – the flat cut side of the sprout browns better and so the more flat surface area, the better. Be generous with the olive oil and add the salt, cumin and pepper. You’ll need a large cast iron skillet because the sprouts should be in a single layer in the pan. If necessary, divide recipe into two pans to avoid crowding. Nothing browns well in non-stick, so (for that reason at a minimum) please avoid it. Let the sprouts cook without stirring until they start to brown. Then stir or shake the pan to flip most of the sprouts over so their brown sides are up. Don’t worry about every little sprout, though. Continue cooking and give occasional stirs to keep sprouts from burning. When the sprouts are tender, hit them with some more salt to taste and serve hot. Are Brussels sprouts relegated to Thanksgiving only at your house, or do you love them any time like me? Cast Iron Skillets. There is no getting around this. Cast iron is the best cookware in the world for people who actually cook. If I did not already own roughly 274 items of cast iron* I would be very tempted by this screaming deal from Lodge: a five piece set of pre-seasoned cast iron (two skillets, a dutch oven with lid and a griddle) for $65. For the cast-iron lover on your shopping list who has everything, I received this 17-inch (huge!) skillet as a Christmas gift last year from Homebrew Husband and I love it like it’s my baby. Oh dear, this makes my mouth water. It brings back old memories. All I can say is to try this with bacon drippings instead of olive oil. Heck, throw in some bacon also. I am growing brussels sprouts in my living room since the growing season up here always gets them to almost ready, then it freezes to -30. I love the little guys, but find that it make a huge difference if you get the little guys still on the stalk. The bulk bin of monster sized sprouts in the grocery store just aren’ good. I cook pan-seared Brussels sprouts all the time here, with bacon, onions and a chopped up Granny Smith apple. So delicious with pork loin. We love Brussel sprouts as long as we can get them fresh. Unfortunately so do our Chix who are allowed in the vegetable garden area after the major harvest……we routinely lose 3/4 of the crop to the girls. We love Brussels sprouts! I frequently throw them on a sheet pan with cauliflower florets, fingerling potatoes, carrots, and onions. Drizzle with olive oil and white wine, sprinkle with kosher salt, pepper and garlic, and roast in the oven. Grate some parmesan over it all, and call it dinner. I grew up eating vegetables that were usually frozen and then boiled until they became textureless, tasteless lumps of green/brown to which large amounts of butter were added. One of my brothers still refers to this as “prison style vegetables.” I grew up believing that I didn’t like vegetables. I particularly hated Brussels sprouts, which were reduced almost to mush and then slathered in mustard. Good grief – they already taste like mustard if you don’t boil all the flavor out of them! Now, they are one of my favorite vegetables. It is all about the preparation. My mother still cooks her vegetables this way and seems to enjoy them, which makes me wonder just how much time she really did spend in prison. Oh, ha, ha, hee, har! You just gave me my first laugh of the day. Thanx! A hearty yes to brussels sprouts! I LOVE them, whether with bacon or not–and since our household is half vegetarian, usually not. Pan-roasting them is the best–so simple and so tasty. Hahaha! “Frickin’ green bean…” My cubicle-mates are wondering what I’m giggling about. They’d have me committed if I told them I was laughing over brussels sprouts! I just ate brussels sprouts for the first time ever last night. I can’t believe I waited so long, because they were delicious! I love the idea of adding cumin to them – I’ll have to try that next time. I am firmly in the “Love Brussels Sprouts” camp. I usually oven roast mine (tossed in olive oil sprinkled with sea salt and balsamic vinegar when they’re done). I do big batches thinking I’ll be able to put some in the fridge for later and then I just keep snacking on them all night long, and before I know it 3 pounds of Sprouts are gone. They are so yummy I can’t keep my hands off them! I’m going to try growing some this year. Here’s today’s local brussel sprouts interesting factoid: here in the NW, you should leave your stalks in the ground/garden until ready to eat. Do not worry about frost. In fact, for best results, do not pick until after the first frost. Like many fruits (low land huckleberries, for instance) and other vegetables (carrots, for instance), the freeze makes the plant set its sugar. If you can wait to harvest/eat until after the first frost, you will have a much more flavorful result than if you pick pre-freeze. Today of all days did I need to LAUGH!!! Oh Thank you!! That looks like a great recipe too. This was my first year trying to grow them, and I’m pouting my head in disappointment as they didn’t sprout (and now the -10C/14F has killed them off for the season). I’m guessing they needed better soil than I gave them…or something.. any tricks you know of to get stellar brussel sprouts? I admit, I’m in the “meh” camp on brussels sprouts. Which is unfortunately, because I want to love-love-love them. Question: If I chuck my (grocery store) brussels sprouts in the freezer over night, and then thaw and cook them… Will they do that sugar-setting thing, or am I just going to wind up with brussels mush? I ALWAYS have Brussels sprouts in my freezer. I tried growing them but it was a bug fest. I just steam them and add a pat of butter at the end. I wonder if frozen world work with pan roasting. I think I will have to try this. Love your blog, read it just about every day. I love brussel sprouts, roasted, mostly. DH is a “super taster” so he steers clear….sadly. You linked to great cast iron cookware, but forgot the newest best option! Lodge Colors (and other enameled cast iron) are a glass-top-stove-safe option for those of us who LOVE looking in cast iron on the stovetop sometimes, but also happen to have smooth glass tops to try and preserve from horrible scratches. We’ve all seen glass cooktops scratched by coast iron (whoa) and also met many a friends who has abandoned their heirloom cast iron pans because of the glass… No need! We eat lots of Brussels Sprouts this time of year, prepared pretty near this way, except – add dried cranberries & pecans instead of cumin. I will definitely try the cumin/ savory route, maybe this weekend. I’m going to have to give this another try. I have only had Brussels sprouts once that I could enjoy it, and that was not so great, but I am trying to expand my palate while simplifying my food to very basic ingredients. We had the oven-roasted variety just last night, and we like them with half a lemon squeezed over just before serving. I’ve never, ever, had luck growing my own, but we get them in bags at TJ’s and I could eat the entire bag myself. 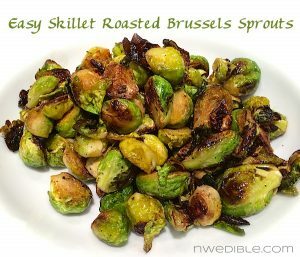 I had sauteed brussel sprouts before, but I made these and they were incredible. I ghround the cumin just before using. Best brussel sprouts of my life! Thank goodness I have a few more in the garden that survived the snow. I just made these for the first time ever. I have never had brussel sprouts before. I CAN’T STOP EATING THEM!!! My wife and I eat brussels sprouts often, usually served with steak. We briefly steam the sprouts, cook the steaks in a cast iron pan, then finish the sprouts in the same pan (with all of the steak juices). They’re fantastic! If we have leftover sprouts, we’ll often throw them into a frittata for breakfast. YUM! Hi Erica! Made this again tonight and Charlie–who used to say he didn’t like brussels sprouts–ran into the bathroom with the serving dish and hissed at me when I said he had to share. At 12, his taste buds are maturing along with the rest of him. 🙂 Tonight I was out of cumin and used a Ras El Hanout blend from World Spice Merchants (Seattle), and that worked really well. Thanks again for introducing us to this now-favorite way to cook sprouts at our house! Sorry if this is a bit late — I just made these tonight. Absolutely lovely, the cumin is a great flavor. I did toast some pecans and added them in at the end, but other than that, I followed it as written. Thanks a bunch!